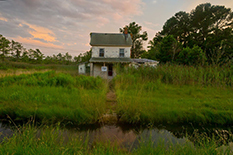 An abandoned home on the Deal Island Peninsula of Maryland's Eastern Shore sits in an area that floods frequently. Maryland’s Eastern Shore is home to some of the oldest farms in the country, but increasingly, they’re being lost to a changing climate and rising sea level that results in land transitioning to tidal salt marshes unusable for agriculture. Rather than just tell this story of this increasing saltwater intrusion, Dani Weissman, a doctoral student in plant science and landscape architecture, is showing it with the use of a “story map.” The interactive data visualization tool is designed to help readers — from farmers to policymakers — understand the issue both broadly and in-depth. Among some of the functions: Users can click through different heights of potential sea level rise to see how much land could flood in the coming century, select regions of the Delmarva Peninsula to learn about local effects of climate change, and consider options for saltwater-tolerant crops. With funding from the Maryland Sea Grant program and in collaboration with the Nature Conservancy, Weissman worked with plant science and landscape architecture Assistant Professor Kate Tully to complete the map project. Tully was recently awarded $1.2 million by the National Institute for Food and Agriculture for her research on sea-level rise and saltwater intrusion on Maryland's Eastern Shore,. The story map is a component of public outreach for the project, which combines crop research, wetland ecology, chemical analysis and economic modeling. The objective is to determine what crop management strategies work in saltier environments, and identify practical applications to help farmers prosper while protecting the environment.